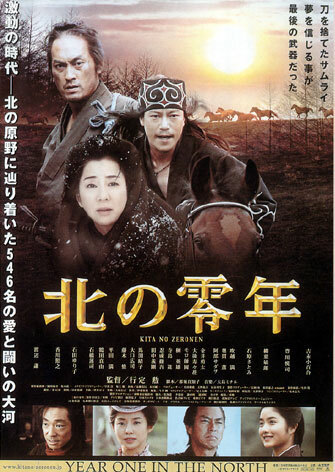 Komatsubara Shino (Sayuri Yoshinaga) and her husband Hideaki (Ken Watanabe) are exiled to Hokkaido, the northernmost island in Japan, during the tumultuous years at the end of the nineteenth century. The family begins their struggle to carve out a new life for themselves in the rugged wilderness, but nothing will grow in the cold and hostile land. Hideaki leaves Hokkaido to learn about new farming technology and his family waits in vain for his return. Several years later, American advisors arrive in Hokkaido and Shino finds herself running a farm, with the help of an Ainu (Japanese indigenous tribe) man named Ashirika (Etsushi Toyokawa). Gradually, Shino and Ashirika's relationship blossoms into love. However, the government orders them to get rid of the horses that they depend on for farming. The man selected to help in this endeavor is none other than her former husband, Hideaki, who is now married to another woman. With Ashirika's help, Shino manages to get the horses back and she decides to remain alone in the wilderness she has grown to love.